Mmmmm... Oven roasted vegetables. This photo shows 3/4 of a recipe. Harvest is nearly upon us. 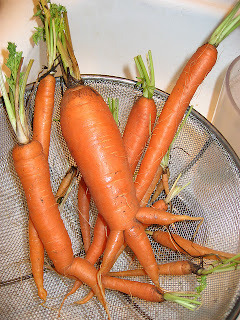 Even some winter root vegetables have begun to arrive in our local farm markets. One in particular is the lowly, underappreciated beet. Beets can be a great addition to your diet. They actually have many varied uses, probably more than you would think. Beets come in red, white, yellow and striped and each variety has a different amount of "beet-iness." They are great raw in salads; they can be pickled and kept in jars for long periods of time; they’re amazing in a risotto (search “beet” on this blog); you can add them to chocolate cake batter; and they’re a natural star in the roasting pan, where their sugars caramelize and make something quite wonderful. Beets are a source of phytonutrients called betalins. This is the antioxidant pigment that gives them their deep red colour. Studies have shown that betalins give antioxidant, anti-inflammatory and detoxification support to the body. A one cup serving of beets yields nearly 35% of your daily intake of folate, 27% manganese, 15% potassium, 14% dietary fibre, plus vitamin C, manganese, iron, copper and phosphorous. One cup also has only 74 calories. Beets have two other potential health benefits: anti-cancer and fibre-related. The combination of antioxidant and anti-inflammatory molecules in beets makes them a highly-likely candidate for risk reduction of many cancer types. Lab studies on human tumour cells have confirmed this possibility for colon, stomach, nerve, lung, breast, prostate and testicular cancers. Beets (and carrots) are both high in dietary fibre. Until recently it was thought that fibre was all the same. This may not be the case. 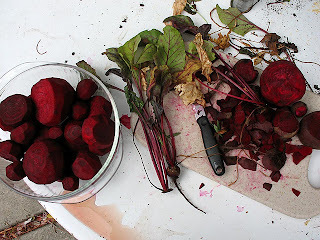 The specific fibre in beets may have special health benefits to the digestive tract. So eat your beets. I bought a 10 lb bag at the farm market. I hope they last… There’s a lot of them for two people. Wash the beets, peel and cut into eighths. Wash, peel and cut the carrots into large pieces. 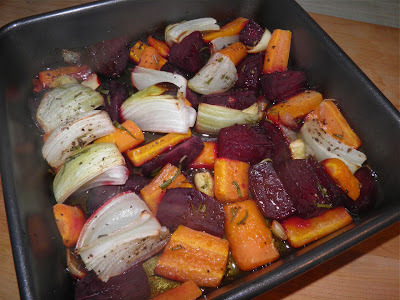 You’re looking for close to the same size pieces of beets and carrots so they will cook in the same length of time. Combine in a baking dish with the garlic and onion. Drizzle with olive oil and sprinkle with the rosemary. If using fresh rosemary substitute the 1/2 tsp dried for 2 tsp fresh. Sprinkle with salt and pepper. 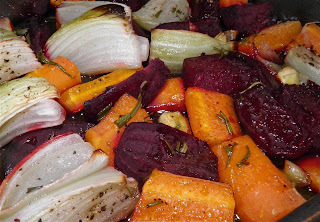 Bake the carrots and beets for 45 minutes to an hour. Give them a shake about half way through. Resist the urge to toss them, or all will turn pink. Total cooking time depends on the size of your cubes. They will pierce easily with a fork when done. Serve with your favourite protien. I had steak with Béarnaise sauce. If you like this post retweet it using the link at top right, or use any of the links below.